Microsoft recently announced their Azure Skills initiative and Azure adoption and consumption is going parabolic. Now is the time to build your Azure skills and prepare for your Cloud Journey. We offer a number of flexible and cost-effective options for you to build your Azure skills and Microsoft is currently providing a number of incentives, course bundles, and discounts. Don’t let your current skills become legacy skills! Check out our Microsoft Official Azure course listings below. There are a number of Azure and Azure related Microsoft Official Courses (MOC) available as self-study MOC On-Demand courses. There are over 60 MOC On-Demand courses that are about 1/4 the cost of a traditional instructor-led class and they use the same course materials and labs. MOC On-Demand courses are identified in the list of Microsoft Official Azure courses listed below. All our Azure course are available to attend as live instructor-led courses remotely from your home or office. Our lack of bricks and mortar means we are able to offer our Microsoft Official Azure courses at about 2/3rds the cost of our competitors. Upcoming instructor led class dates are listed below. A green dot next to the date indicates that class is guaranteed to run. Rest up, get a cup of coffee, hold on tight and get ready for an Azure brain dump, boom. 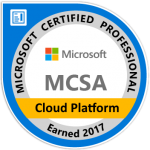 When we are not ramping up consultants and integrators around the country we offer intensive 5-day Azure Boot Camps that prepare you to pass the 70-535 and either the 70-532 or 70-533 exams to earn your MCSA Cloud Platform certification. Learn more about Microsoft Certification in our blog post including MCSE electives. Azure Boot Camps are listed below. Microsoft has a big push on to build Azure competency in the market and is offering discounted and free retakes for Azure related exams and discounts for multiple course titles. Learn more about Microsoft Certification in our blog post that includes a certification roadmap or call us for more information at (206) 495-9980. If you need to get your whole team skilled up on Azure or want to create a custom course for your team we’re ready to help you out there too with top-notch instructors that have been working with Azure for years. Give us a call to learn how we can tailor training for your specific needs at (206) 495-9980. Moving to the cloud means DevOps, automation and scripting and while Azure supports many scripting languages PowerShell is the preferred choice of many and you can see our Official Microsoft PowerShell courses listed below. With Azure services you can now process, analyze, report, and gain business insights from your data like never before and at unbelievable scale. Be sure to check out or Data Platform and Analytics courses listed below. Don’t let your current skills become legacy skills!